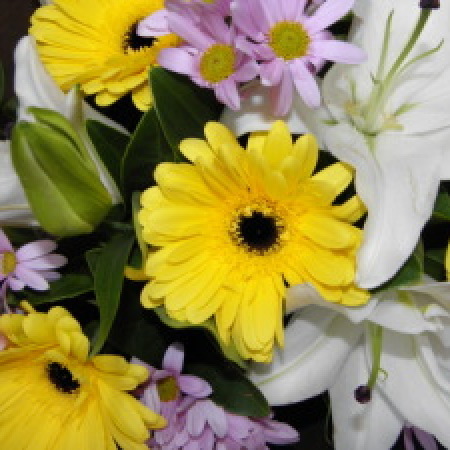 Amaranthine`s Oriental Splice is a fresh and modern bouquet, filled with the beautiful fragrance of the classic oriental lilly, bright yellow gerberas and long lasting chrysanthemum, set amongst lush green foliages this bouquet is sure to please. Ideal for a Birthday, Anniversary, Sympathy or just because someone special deserves it. Oriental Splice is a gorgeous bouquet from Amaranthine Flowers By Design, Charlestown Square, Newcastle. Same day delivery available, seven days a week, to all areas of Newcastle and Lake Macquarie, including John Hunter Hospital, Newcastle Private Hospital, Lake Macquarie Private Hospital, and Mater Hospital.